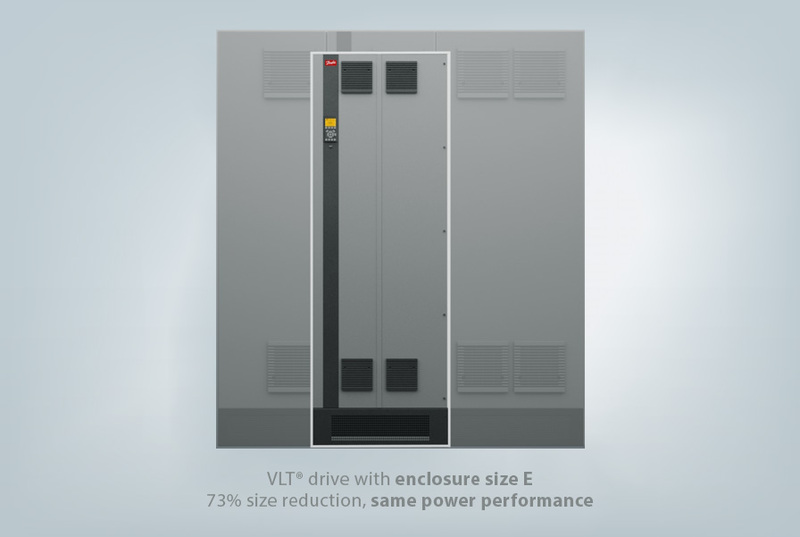 With the new VLT® drive enclosure size E, you get even more power in the package. This drive delivers the highest possible power output for the physical dimensions of the drive – with up to 73% size reduction compared to the previous generation product. 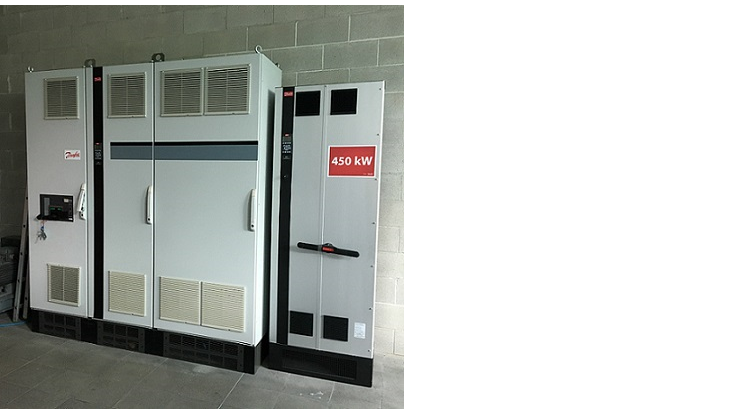 The compact size and innovative cooling technology combined with the capacity for side-by-side mounting have huge implications on the size of the cabinet and control room. See how in this animation. High power density means high amps per millimeter cabinet width. You get lots of current for a compact size. In fact, with these drives you get the most current per millimeter width on the market, for a single drive. How does this drive achieve its high power density? The secret is in the cooling technology. The heat sink of the new VLT® drive enclosure size E is filled with heat pipes in order to optimize the heat transfer. A heat pipe is a closed vessel, which conducts heat 100 times better than extruded aluminum. Each heat pipe is filled with a passive working fluid, and then completely sealed. The heat removal happens by the evaporation and condensation of the working fluid. This technology is actually well established as a cooling concept in other industries, for example in aerospace, and in cooling laptop computers. At Danfoss Drives, developers have transferred and adapted the technology to variable speed drives, where it has proven to deliver extremely effective heat management over many years. Now in its third generation, the technology is extremely robust and effective. For customers, this means a robust and reliable drive, with a cooling system that requires no maintenance. Remember, this is still an air-cooled drive, and the heat pipes work in a closed circuit. A unique ducted back-channel passes cooling air over the heat sink with minimal air passing through the electronics area. This allows 90% of the heat losses to be exhausted directly outside of the enclosure and the room, improving reliability and prolonging life by dramatically reducing temperature rise and contamination of the electronic components. Even in harsh environments, the sensitive inner components are well protected by an IP54/UL Type 12 seal, which separates the back-channel cooling duct and the electronics area of the VLT® drive. How does it work? 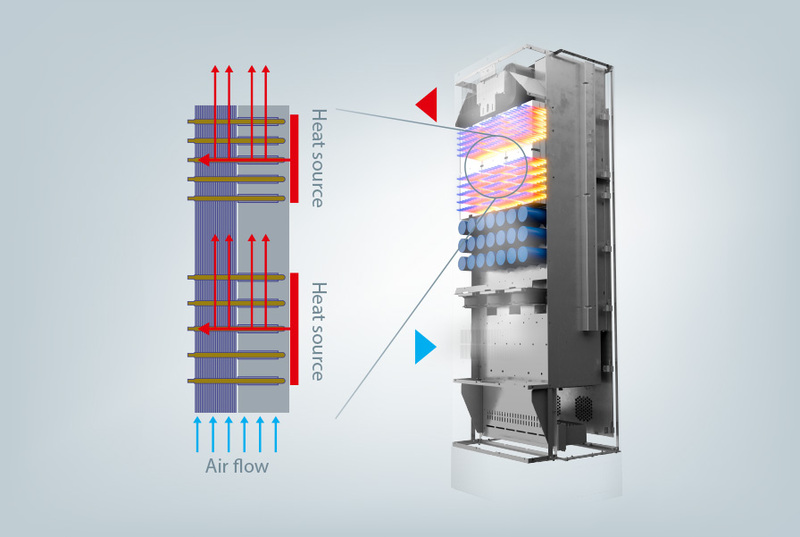 Air from outside the room is drawn into a vent at the bottom of the drive, rises up to the top where it absorbs heat from the heat sink, and is expelled through a vent at the top of the drive. The new VLT® drive enclosure size E is designed for 100% load at 45°C. The effective heat management allows the maximum utilization of the IGBTs, approaching results of liquid-cooled drives in terms of silicon utilization, but using air-cooling. High efficiency saves operating costs as well as the back-channel cooling is accompanied by a series of other design features, which result in net 98% energy efficiency of the drive at full load, throughout the whole power range. These design features include variable-speed cooling fans, low loss PWM (pulse width modulation) patterns, and low loss DC link reactors – as well as reduced busbar lengths. To learn more, watch the animation or read the fact sheet. You can also read more about the drives. Enclosure size E is available for VLT® AutomationDrive FC 302, VLT® AQUA Drive FC 202, VLT® HVAC Drive FC 102 and VLT® Refrigeration Drive FC 103. Keep following this blog for more information on the the new VLT® drive enclosure size E. And don’t hesitate to post a question in the comments section below. We are happy to help. How do I find an IOM for a VLT drive. great Job in designing and shrinking, btw! Hi Lars, as stated above, this is still an air-cooled drive, and the heat pipes work in a closed circuit -i.e. no need for external cooling system. Thanks for your offer, though.